When I was a teenager I used to ride my bike all the time. I would explore the neighborhood on two wheels while I rocked out to the Petra tapes in my walkman. I would be out for what seemed like hours letting the wind rush past me while I had visions of riding for the USA Olympic Cycling team and winning the gold medal! No, I never competed. I never entered a race, other than racing the kids in the neighborhood, but man was I fast! I could whip around the corner at lightning speed then ease up and cruse around while riding with no hands. I didn't ever have the coolest or most expensive bike but in my mind I was a champion. I loved riding. I loved the freedom. I loved the speed, but most of all I loved my time with God. There was something about being out on the open road with the wind blasting in your face in the middle of God's creation that really helps put things in perspective. I would ride when I was happy. I would ride when I was mad and just needed an escape. I would ride when I was confused and just looking for answers. I loved riding. 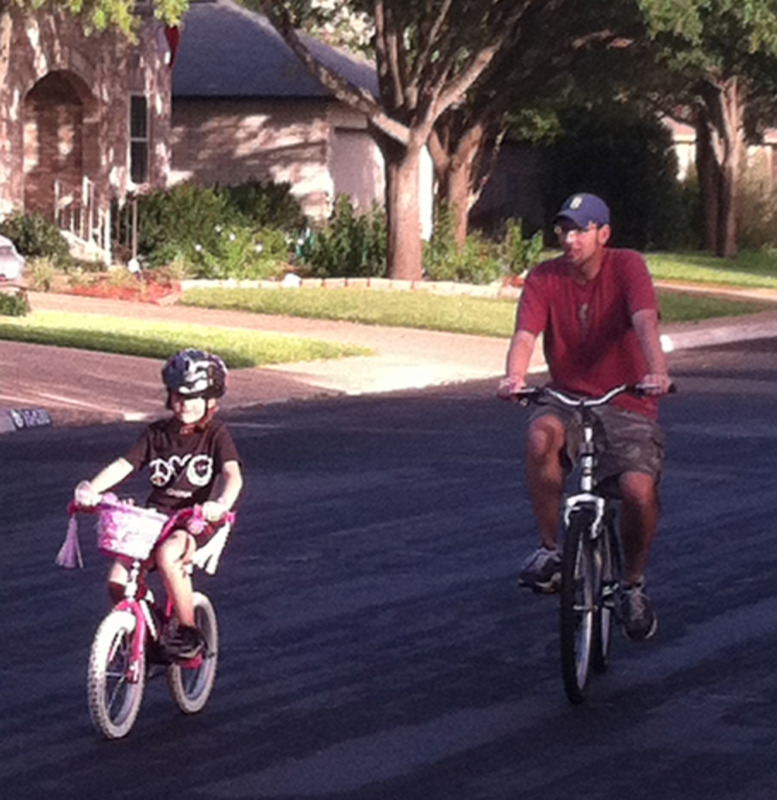 Gabi, our 7 year old daughter, has just recently learned to ride her bike with out training wheels. She is amazing! At first, it was very scary (for her and me!). Falling and getting hurt, the idea of not being completely in control and the excitement of being a "big girl" were all thoughts running through her mind as we started this journey. Yes, there were several falls, none too severe, many tears and a bit of frustration but we seem to have gotten through to the other side and now she is riding like a pro! The other night we were able to take a bike ride together. Slowly and steadily we made our way up the hill to the elementary school in our neighborhood. As Gabi was riding, still a little unsure of her new tallent, I was encouraging her and cheering her on. While she was riding she would tell her self, "I can ride my bike. I can ride my bike. I can ride my bike! I CAN RIDE MY BIKE!" At first she was trying to convince herself that she could do it but the further we went the louder and more excited she got! Then she was yelling it out so that everyone could hear and see what she was doing! It was so much fun to see her becoming confident in herself and ability! I was such a proud Papa! My little girl did it! As I watched this happening, and later when we got home to talk about it with Michelle, I thought about how God must feel when we use the gifts He has given us. When we realize we are doing what He has created us to do. When we scream at the top of our lungs "I can do this. I can do this! I CAN DO THIS!" Life can be scary. We may fall and skin our knee, we may be afraid of loosing control, we may want to give up and just sit on the curb and cry for a while, but we have a loving God who will just sit and hold us or help us get back on that bike, cheer us on and be proud of us no matter what! He loves us! I pray you see His love all around you today! Now go grab your helment and lets ride! I'd love to hear your thoughts! Feel free to leave a comment here or on our Facebook page www.facebook.com/justingravesband Don't forget to share this with your friends! See you soon! Newer:You think you got Trouble?!? !Older:Call me Crazy!